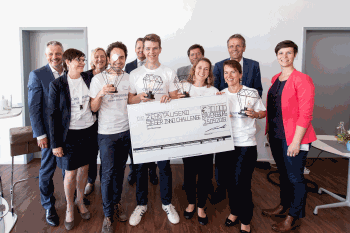 Ravensburg, Germany, September 26, 2018 / B3C newswire / -- Taking part in the Open Innovation Challenge – Injection 2.0, which initially began in June, 18 participants consisting of four teams submitted their ideas on how digital trends can be made to be both useful and profitable in the everyday life of its users. Following workshops and field phases, Vetter has now awarded the winner of the challenge. A method to improve the documentation process as it pertains to the administration of drugs, helping to make the process easier, faster and safer. The winning team received a prize of EUR 10,000. As a next step, the Contract Development and Manufacturing Organization (CDMO) will decide which project ideas or elements will be worked on in the future. The four teams were arranged in a multidisciplinary fashion, including students and professionals from the fields of medicine and economic sciences, as well as members of the Vetter staff. The project itself is considered innovative, as is the employment of the user-centered method ‘Design Thinking’. Following the June kick-off workshop, participants entered into dialogue with the users of injectables, in particular, caregivers and patients. With the help of this first-hand knowledge, the teams first designed initial idea concepts and prototypes for discussion and testing among potential users. Further development followed. On September 25, the four groups presented their ideas in short presentations at the company’s Ravensburg Vetter West site. The jury deciding the final winner consisted of Prof. Dr. med. habil. Folker Wenzel, a practicing physician and academic dean for technical physicians at the HFU Furtwangen, Eva-Maria Makutzik, an innovation manager at EIT Health Germany, complemented by senior management representatives of the organizing company Vetter.